This editor can directly edit property files written in Unicode reference characters, and saves the time and effort of converting into Unicode through native2ascii. In addition to the usual functions of an editor, the plugin is integrated with Eclipse. 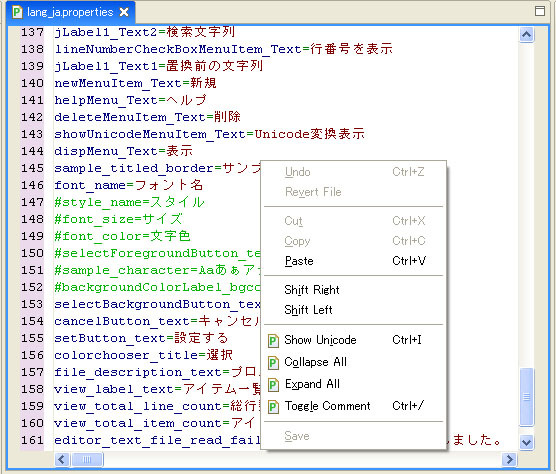 Files can be opened in the IDE and saved in Unicode. It can use by intuitive and simple operation. 7 Cannot continue the operation. There is another install operation in progress. By adding the following code below to your website you will be able to add an install button for Properties Editor. The update site should be updated as the following url.